There’s an antique shop near my house, in what’s called the Columbia Waterfront district, by the name of General Nightmare. 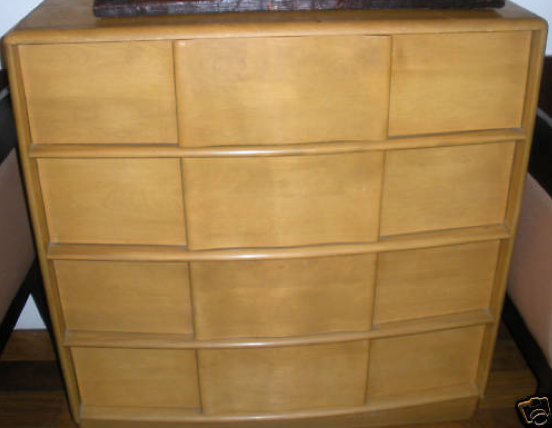 And as with many secondhand furniture shops, they refinish much of the pieces they buy. I was chatting with the proprietor about a fantastic desk he had in the front of the shop. 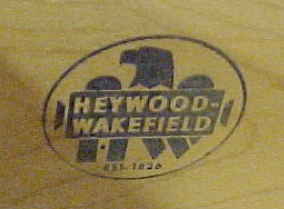 He mentioned to me that he’d refinished it in a dark stain because “no one wants the blonde wood anymore.” But to me, that’s what makes Heywood-Wakefield furniture so beautiful. Whether in maple, champagne, or wheat finish, I find that the streamlined birch wood designs complement both modern and vintage furnishings. What’s even better is that this stuff lasts. Of course, as with all old furniture, many H-W pieces often need polishing or refinishing for surface scratches. On the positive side, due to its durability (and having been mass-produced between 1936 and 1966), H-W furniture on a whole isn’t as expensive as it probably should be. We have three pieces of H-W in our house, mixed in amidst the Ikea, West Elm and random flea-market finds. My husband’s dresser is definitely my favorite. 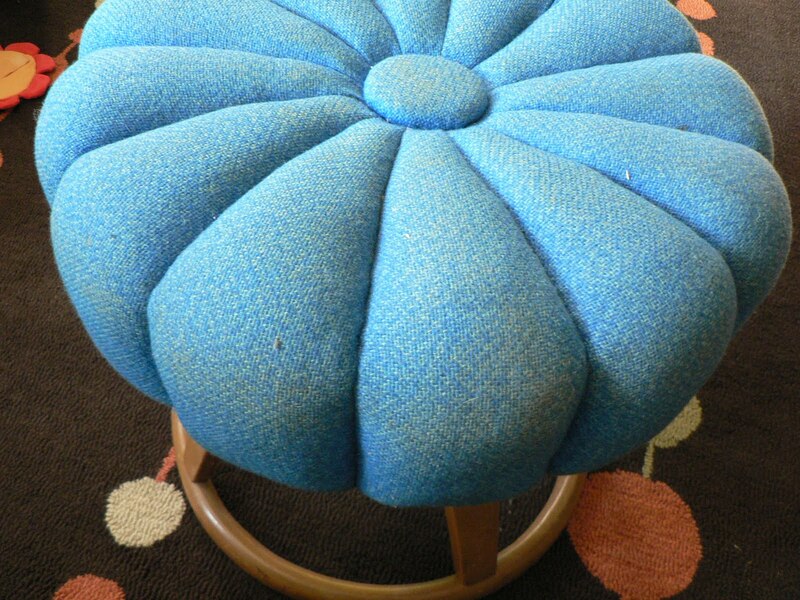 But the blue ‘pouf,’ featured below, is a recent Ebay bargain. 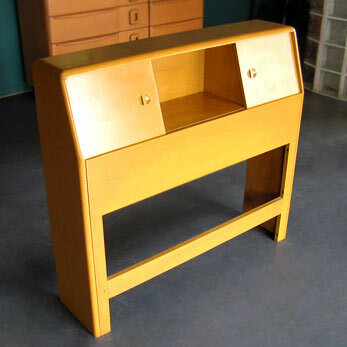 Originally a complementary piece to a vanity set, we use it as a footrest/stool in the living room. It’s due for reupholstery, but for less than $100, the price really couldn’t be beat. Imagine a pair or three of these in a girls room – all upholstered in the same fabric. And before you buy a new toddler bed, consider a H-W headboard. 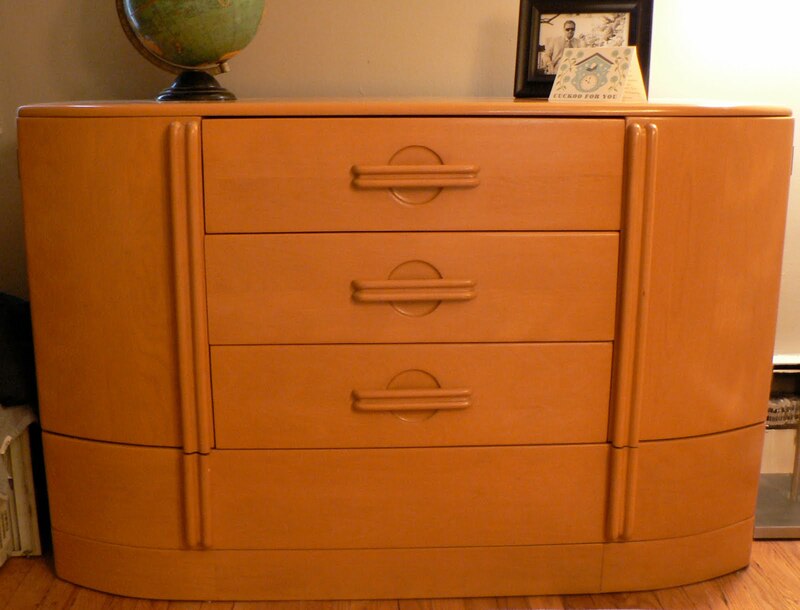 This one – with room for storage – is more expensive because it’s already been refinished. But if you’re handy, find a piece that hasn’t been reworked and buy a refinishing stain kit like the kind sold here. 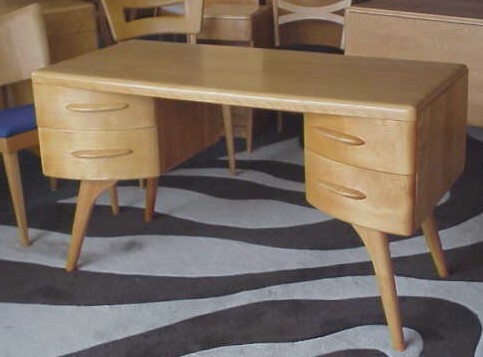 The desks are pretty incredible, in that unique ‘boomerang’ shape. Final tip: Ebay sellers will give you a great deal if you can pick up the items yourself. 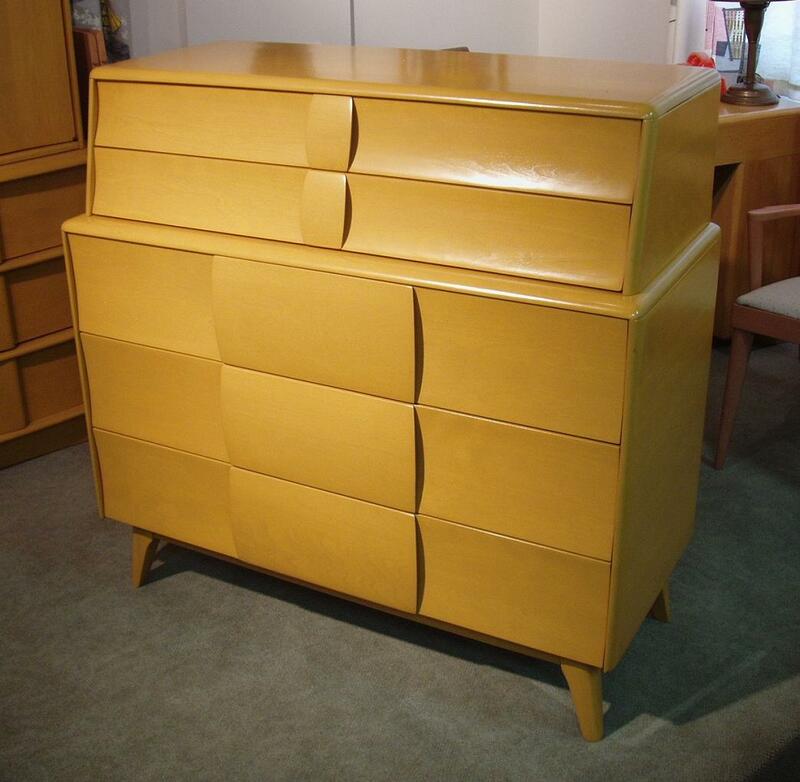 As with much of mid-century wood furniture, these pieces are HEAVY and often not worth your while to have shipped.